The (Window) Shopping - St Barts has some fabulous stores and it was a real treat to check everything out. I tried to contain myself around all of the beautiful products, but did break down right before we left and bought some pricey eye shadow. I convinced myself it was a genius purchase because I could think about St Barts every time I wore it. The Normandie Hotel - We dropped in at this newly renovated hotel in Lorient and it was so wonderful. There are 8 rooms, an adorable pool and it's within walking distance to the beach. The décor is very modern and clean. 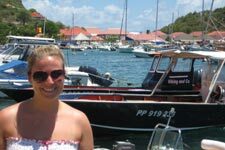 Room rates are 95 Euros during low season and 170 Euros during high season, so it is an amazing value on St Barts! 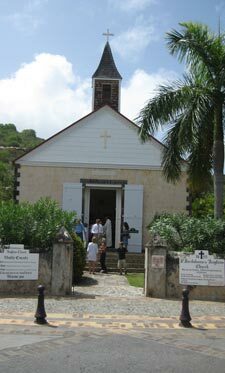 Sunday Mass at the Anglican Church in Gustavia - Doug and I started our first full day in St Barts with going to church. Regardless of your religious affiliation, I definitely recommend stopping in for Mass. The church is so small and precious and its communicants are some of the kindest most genuine people I've had the opportunity to meet. You will leave feeling good for the rest of the day! The Sibarth Villa Owners Party – I had the wonderful opportunity to attend the Sibarth party for villa owners, which took place poolside at the Guanahani hotel. Everything was so well done and it was such a pleasure to meet all of the owners and their families! Staying at Hotel St Barth Isle de France – We spent our last two nights in St Barts at Hotel St Barth Isle de France and it was a real treat. The hotel staff took wonderful care of us and everything was immaculate. The first thing I did was take a nice bath in the huge bathtub. Also, having croissants and coffee delivered to my patio table for breakfast was great. However, I think my favorite part was the massage I got at the Isle de France Spa. It was my first massage ever and it will certainly not be my last. All of the spa attendants were very professional and kind, and they finished my massage by bringing in a nice tray of various sorbets and water with an orange slice in it. As you can see, we really experienced St Barts to the fullest! However, probably the most important part of our trip was visiting several of the villas that Wimco represents. Our website has gorgeous pictures, but not even those can prepare you for how impressive these properties truly are. Some villas that really stood out to me included SIB DKD, a 2 bedroom in Pointe Milou that is completely flawless. The furnishings are light, comfortable and immaculate. SIB AOM in the gated community of Mont Jean has one of the most impressive pools and views and each section of the villa has its own distinctive flair. SIB SAS is the perfect villa for a first or second honeymoon. 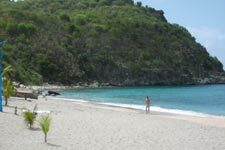 It is in the St Jean hillside, so it is only minutes from everything St Jean has to offer, but it still affords complete privacy and relaxation. SIB OTO in Gouverneur is really funky and interesting. From its zebra print chairs to its mini media alcove with overhead 'stars,' the creativity that went into this villa made a lasting impression on me. On the newer end of the spectrum, I had the opportunity to see some real stunners. SIB TOR is a fantastic 1 bedroom in Lorient. It is the perfect size for one couple and totally comfortable and well done. SIB KAY is a 5 bedroom villa that feels more like your own private Zen retreat. It is spread out into separate bungalows and decorated with eclectic treasures from the owner's travels. SIB KYR in Lurin is contemporary and features custom-made Java teak furnishings. The double levels ensure privacy for everyone. SIB JAY in Mont Jean is one of the most talked about new villas, so I was thrilled to get to see it. Its views are outstanding, the décor is fresh and classy, the pool is huge and the kitchen is a chef's dream – there are 2 of everything!